Check Out Our Rocket-Firing Scale Barge! Click Below. Even those models of ours not specifically designed to replicate catastrophe often flirt with disaster. Most of the time, they come away with only a scratch or two -- but not always. It stayed on display in the house for many years, unable to fly because it lacked a guidance rod of sufficient scale. Finally, we invested a half-hour of our time in scratch-building a launch pad and new guidance rod, and Phoenix had many happy flights ... until this fateful day. We'd invested in some Estes rocket engines -the Phoenix can only fly with the "mighty D"- and were excited to fly the missile again. Too excited, as it turns out, to notice that we were about to fly the Phoenix with a D12-7 engine. The "7" is the important part of the designation; it stands for the number of seconds before the engine fires the parachute recovery charge. The recommended engine for the Phoenix is the D12-3. Meaning the engines we were flying would wait four seconds longer than recommended to fire the recovery charge. Oh, and also: we were flying on a day with a very high crosswind, so we were using a very steep launch angle. We considered what we'd learned from all this, and headed home for some quick repair work. When we returned to the sod field a few hours later, we'd taken some scissors to the missile's damaged forward fuselage. Our stumpy "Phoenix Lite" gave us several more flights that day thanks to some more conservative launch rod angles. You can tell we still hadn't replaced the D12-7s, though; our panic is audible in this next video when the chute once again takes its sweet time deploying. Sometimes, we're slow learners. After a few more flights like that (and a run-in with a tree), we decided to call it a day. We took our shortened and battered Phoenix home, where it is currently enjoying an early retirement. Rockets are awesome. Underwater photography is also awesome. We had to try and put them together. This video was shot in a very hasty fashion on a Monday morning when a lot of other things needed to happen. We weren't able to set up a surface camera because we were lacking Video One due to short notice, so this was a single-camera shoot. Still, we're glad we got the footage we did. We glued an engine into the tail end of an Estes Alpha III with CA, and sealed the igniter in place with candle wax in order to waterproof it. The nosecone of the rocket was sealed in place with CA glue as well (we knew we weren't going to be recovering this one intact, so the parachute was not a consideration). Due to the short notice mentioned above, we had almost no protective gear, and also no plan for keeping the buoyant rocket on the underwater launch pad. So Mike waded into the icy bay and held the rocket down manually with a fingertip, only letting go once Willie's countdown reached "one." The rocket fired, immediately arced over, and traveled approximately 150 feet, crash-landing on the beach. No matter, though: the rocket had taken flight from an underwater launch pad. The mission was a success. The Revell FireStrike Pro is one of those very lightweight, indoor-only helicopters that are a ton of fun to fly -- and very easy to crash. This particular aircraft is often seen buzzing around the RapidNadion shipyards on slow days, or when the weather outside is too windy or rainy to float boats. We were indoors on one such day when we decided to film the FireStrike with our then-new Casio Exilim FC-150 to see if we could get some high-speed shots. Thanks to a good amount of light in the room, we were able to capture some great slow-mo action - including a crash into a couch arm. Now we just have to hope we're rolling film when that wobbly starboard-side pontoon finally decides to fall off mid-flight. Okay, turn your volume down for this one. Willie took the opportunity for a heli flight on a calm winter day in 2009, and encountered a small puff of air that sent his Lama V3 into a tree - and thenceforth to the ground. Fortunately, he was filming the flight with an on-board FlyCamOne(2), which recorded the whole thing and, as usual, survived to tell the tale. Seriously though, turn your volume down. 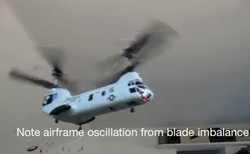 This whole video is nothing but high-pitched electric heli noise followed by a clattering crash. The chopper required some repairs, but it's still flying today! The tree, also, is no worse for wear. After seeing our first video of someone strapping a camera onto an Estes rocket, we knew we had to follow it up with an on-board camera launch of our own. We wanted to see the North Fork from dizzying heights! We accomplished that end, but may have taken "dizzying" to a new level. The camera is one of our off-brand gum-stick units mounted inside an Estes "Flash" rocket. This particular rocket's upper half is one giant cargo compartment, so we cut a round hole about 5/8" wide in the side, and devised a rig of foam padding and bracing toothpicks to keep the camera stationary. This configuration was the product of several late-night design hours, and we were rather proud of it when it paid off. Keeping the camera centered in the viewport was quite challenging; you can see Mike fiddling with it a bit in the video, just before launch. The problem, as you'll see in the video, is that this rocket (and most of them at this size) spins. It spins on ascent, and it really twirls like an over-caffeinated ballerina on the way down. So the end result is that you can see some wonderful East End sights from aloft in this video -- if you watch it frame-by-frame. Once again, you'll want to turn your volume down for this one. The roar of air passing over the viewport is quite loud. As one commenter put it, "I'm glad I watched this rocket before lunch! Lots of rotations." Yes, indeed. Still, it was a beautiful Easter Sunday, and we got some terrific still frames from aloft, so we call this one a success.